I always love going to Witchfest - not only is it the largest gatherings of witches in England, it is also just a bus ride away from where I live in south London - but this year's event was the best I've been to in a good number of years. The talks were superb, with so many to choose from and illustrious speakers including Melissa and Rufus Harrington, Pete Jennings, Vivianne and Chris Crowley, Christina Oakley Harrington, Damh the Bard, Philip Heselton, Barbara Meiklejohn-Free, Yvonne Aburrow and Professor Ronald Hutton. I really don't have space on this blog post to type up my notes from all the lectures, but here are brief summaries of a couple. In the first talk of the day I heard Melissa Harrington on Which Witch is Which? She looked at the different strands of modern pagan witchcraft, from what can be seen as the start of Wicca in the mid 20th century to the current times when there are a huge number of paths and traditions to choose from. She talked about how in the early days there was "the old legend of the Old Religion" in which most Wiccans believed they were part of a faith that had an unbroken lineage for hundreds, if not thousands, of years. Of course nowadays, after books such as Ronald Hutton's The Triumph of the Moon, most people feel the historical evidence points to Wicca being a new religion, but with old roots. But that religion now has a huge number of branches. As well as being Gardnerian and Alexandrian Wiccans, there are hedge witches, kitchen witches, feminist witches, eclectic and solitary witches and Wiccans to name just a few terms in modern usage. There can be arguments - sometimes heated arguments - about whether one type of witchcraft is better or worse than another. Melissa said she felt it is important that we all respect each other's styles of witchcraft. 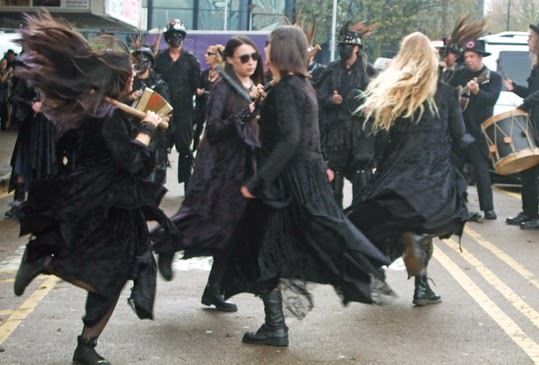 Paganism is the the largest growing religion in the UK and the largest group of pagans call themselves witches. We should recognise that witchcraft - and Wicca - are multidenomenational. We also need to be flexible in our outlook. Many different academics and practitioners have written about the history and theory of witchcraft, but they aren't always right and new evidence can emerge that changes our perceptions. Going back to the debate about the origins of Wicca, we cannot know if in the future some long-lost document will come to light that turns around our current understanding of the history of the Craft. That point at the end of Melissa's talk seemed particularly pertinent later in the day in the talk by Philip Heselton called In Search of the New Forest Coven. Philip is renowned for his research into the Wicca's ancestors of tradition, particularly his books about the life of Gerald Gardner. He is currently investigating the older members of the New Forest Coven, which Gerald Gardner was initiated into. One lead he is following came from a note made by Doreen Valiente in the margin of one of Gerald's books - it said "Mother Sabine". Philip believes that might be referring to "Rosamund Sabine" who lived in the New Forest area in the 1920s, but had earlier been involved in various esoteric groups. There are hints and references that Rosamund may have been the original witch who founded the coven and Philip is currently seeing how far back he can trace her witchcraft origins. The high quality talks are, perhaps, the main reason for going to Witchfest, but shopping, meeting friends and enjoying music and dancing are high on the list too. There was a wonderful range of stalls selling lovely clothes, witchcraft supplies and other goodies in the market area. I bought a few gorgeous things, but wish I'd had more money because there was much more I would have bought if I could have afforded it. 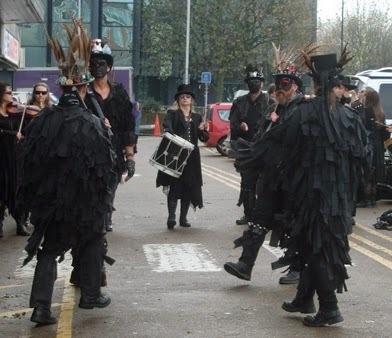 The pictures of Morris dancers show Wolfs Head and Vixen Morris entertaining the crowds outside the venue at Fairfield Halls (photography is strictly banned inside the building). I also had a really lovely time chatting with old friends in the bar and making a few new friends too. Pete Jennings: Blacksmith Gods, Myths, Magicians and Folklore. Wow, that looks and sounds like an amazing time! I came across your blog by searching for the superstitions behind double yolked eggs. :) I'm happy I did! I'll be back. Your blog is awesome! Happy Monday!